The Cumberland & Dumfriesshire Farmers Mart P.L.C. had forward 35 prime cattle, 1 young bull, 30 over thirty month cattle, 4,897 prime lambs and 6,210 cast ewes & rams at their weekly sale at Longtown on Thursday 5th August, 2010. Clean cattle were short of numbers. Top prices of 171.5p, 169.5p, 167.5p, 165.5p for Limousin bullocks from Dashwellgreen. Simmental 146.5p Sceughdyke; Blonde 152.5p The Gill, British Blue 158.5p, 155.5p The Gill. Top price per head £1056.38 for Limousin from Dashwellgreen. Heifers to 153.5p, 151.5p for Charolais from Upper Mains; Simmental 147.5p Sceughdyke, Limousin 148.5p Woodslee, British Blue 140.5p Houghton House. Top price per head £910.35 for Limousin from Newtown. OTM cattle met a brisk trade with an increased number on offer. Limousin cows sold to 123.5p from JP Lee, Morley Hill who sold others at 107.5p, 95.5p; Hereford 103.5p, 89.5p Enzieholm; Shorthorn 92.5p Barton Farms. Limousin OTM bull to 91.5p Morley Hill. Prices per head Hereford £716 Enzieholm, Charolais £698.63 Blindhillbush; Limousin £714.88 Morley Hill; Shorthorn £515.63 Barton Farms. The large show of prime lambs were presented to a large ring of buyers and resulted in an excellent trade, averaging at 178.7p overall. 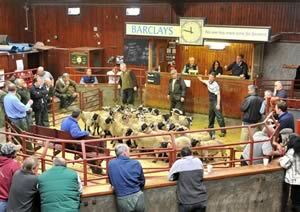 The young handlers sale was held this day (separate report) but the top price apart from these were to a top of £93.50 for Texels from Messrs Millar, Crookholm, others from the same £91.50, £90 Burnside; Suffolk x £88.20 Becton Hall, £87.80 Cardew Hall, £86.80 Barnglies, £84.50 Old Wall; Bleu de Maine £73.80 Glebelands, £64.50 Keld Head; Charollais £75.20 Knowe, £73.20, £69.20 Hallburn, £67.80 Mossthorn; Greyface £75.80 Albierigg, £75.50 Plump & Low Roughill, £74.20 Knocknain; Cheviot Mule £86.50 Archerbeck; Blackface £69.50 High Edges Green, £61.50 Peela Hill; Swaledale £54.50 Low Roughhill, £52.80 Howburn, £50.20 Stonehall; Herdwick £61.80 High Lodore; Beltex £79.80, £77.80 Waterside, £74.80 Nether Dargavel; Zwartble £80.50 Stanley House; Oxford £65.80, £65.20 Guards Farm. Lightweight lambs to £70.50 for Texels from Bellmount, £68.80 Edendales, £67.20 Carlenrigg; Suffolk x £63.50 Carlenrigg, £63.20 Rimington Way; Bleu de Maine £64.50 Keld Head; Charollais £60.50 Mossthorn; Greyface £65.20 Knells, £61.50 Albierigg; Blackface £64.20 Penpeugh; Swaledale £52.80 Howburn, £50 Burn House; Zwartbles £55.50 West Craigs. Cast ewes and rams were in demand with a large show forward to many buyers. Top was £168.50 for Suffolks from Borderview, £118.50 Falla, £112.50 Downland. Cheviots £74.50, £72.50 Effgill, £72.50 Easthouse; Texel £153.50 Downland, £138.50 Severs, £134.50 Coytre; Charollais £98.50 Severs, £92.50 Effgill; Leicesters £100.50 Tinnis; Blackface £76.50 Glenramskill, £70.50 Highside; Swaledales £70.50 Nookton; Herdwicks £58.50 Whinney Brow; Lleyn £69.50 Mossfennan; Dorset £96.50 Easthouse. Heavy ewes to £133.50 for Texels from Downland, £128.50 Roadside; £126.50 Easthouse; Suffolk £126.50 Lynegar, £124.50 Abbeymoss, £122.50 Severs, £120.50 Huntington; Bleu de Maine £92.50 Glebelands; Charollais £122.50 Coytre, £116.50, £103.50 Severs; Halfbred £96.50 Borderview, £87.50 Hoddamtown, £82.50 Crumhaughhill; Greyface £94.50 Muircleugh, £86.50 Stackbraes, £83.50 Westend; Cheviot Mules £102.50 Muircleugh, £100.50 Torwoodlea Mains, £92.50 Clackmae; Leicesters £126.50 Westhouse, £124.50 Midtodhills, £123.50 Stackbraes; North Country Cheviot £100.50 Philiphaugh & High Moat, £98.50 Torwoodlea Mains, £96.50 Chirnfoot; Beltex £104.5p Mouldy Hills; Lleyn £72.50 Lydden, £60.50 Glebelands, £59.50 Mossfennan; Zwartbles £86.50 Stackbraes, £80.50 West Craigs; Dorset £76.50 Edge, £68.50 Bellmount. Light ewes to £84.50 for Cheviots from Whinfield, £73.50 Coytre, £72.50 Effgill; Blackface £70.50 Old Police House, £66.50 Nilston Rigg & Kirksteads; Swaledale £64.50 Highside, £62.50 Barrowfoot & Kilnstown, £60.50 Midtodhills; Herdwicks £58.50 Whinney Brow; Jacob £46.50 Tarnside House; Soya £75 Coytre.